Barriere was 24-of-36 passing for 245 yards with an interception and second-half touchdowns to Dylan Ingram covering 4 yards and Johnny Edwards for 19. Photo courtesy EWU Athletics. Barriere was 24-of-36 passing for 245 yards with an interception and second-half touchdowns to Dylan Ingram covering 4 yards and Johnny Edwards for 19. 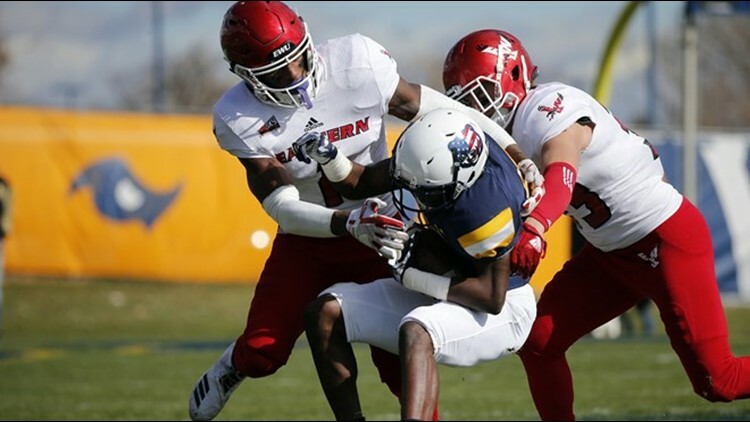 GREELEY, Colo. (AP) - Eric Barriere ran for two touchdowns and passed for two and Eastern Washington rolled to a 48-13 win over Northern Colorado on Saturday. Barriere scored on runs of 9 and 15 yards and finished with 64 yards on the ground to help the Eagles (7-2, 5-1 Big Sky Conference) pile up 292 of their 562 yards on the ground. Antoine Custer Jr. led the way with 122 yards on 16 attempts. Trae Riek capped the Bears' opening drive of the second half with a 1-yard run that made the score 20-7 and Conor Regan hit Milo Hall for a 16-yard score late in the third that made it 34-13. Northern Colorado (2-8, 2-5) had 259 yards offense with six sacks, three turnovers and three failures on fourth down.